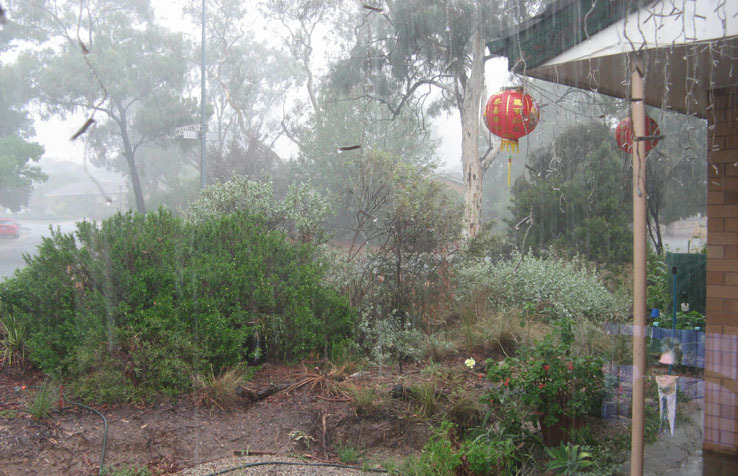 Yesterday afternoon was very wet – 86 mms of rain over two hours worth of wet! Down she comes, a very rainy afternoon in Canberra. What better excuse could there be to have a dinner of deep fried food, mainly tempura, with some pan-fried eggplant and zucchini with dengaku sauce on the side. 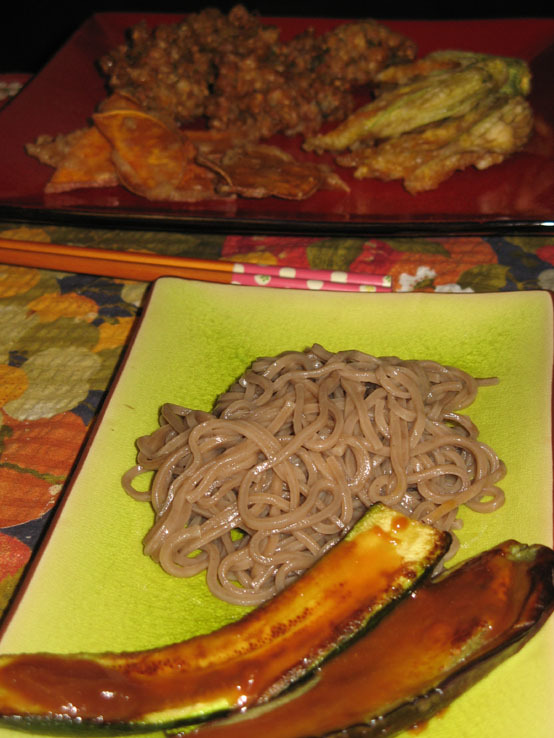 Eggplant and zucchini with dengaku sauce and soba noodles. My favourite veggie tempura is corn, and we were able to use our first corn of the season, collected in between downpours, to make tasty tempura nodules. First take equal quantities of corn flour and self raising flour, in this case 3-4 tablespoons of each and mix with an equal quantity of soda water. If you have it, add a sprinkle of Japanese 7 spice powder, sometimes called Red Pepper Mix, ‘Shichimi Togarashi’ to the batter for extra flavour. You could also add other spices to the mix depending on your taste. Mix the batter quickly, it should be runny and you don’t need to get out all the lumps. If you beat the mix too much you will activate the gluten in the flour and end up with a soft, rather than crispy, batter. Make sure you oil is up to cooking temperature before you start dipping the vegetables in the batter. 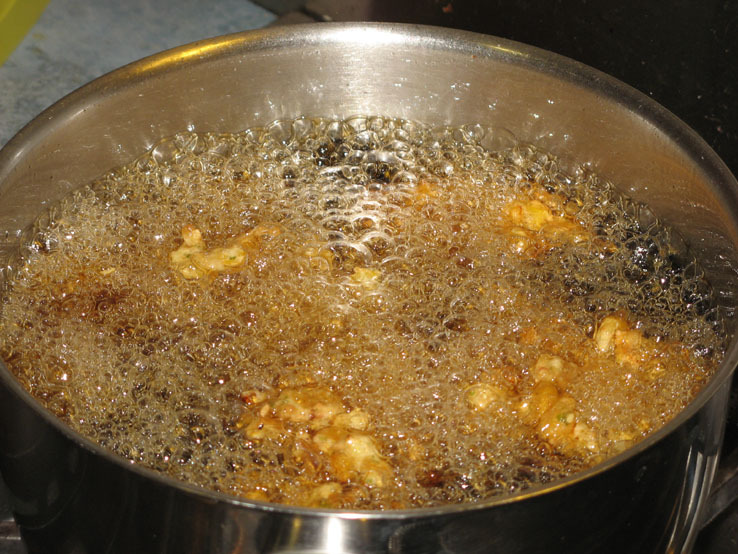 This is how your oil should look when you are frying the tempura. Have your corn kernels ready in a separate bowl. Add a small amount of batter to the corn, not the other way around! You want to just coat the corn, not drown it. Quickly place a dessert spoon of corn into the hot oil and cook until golden brown. The remaining vegetables can then be quickly dipped in the remaining batter before being cooked. Just remember the batter on your veggies should be a crisp thin skin, not a thick soggy blanket. On our final platter you can also see some of our zucchini flowers and some sweet potato (not grown by us) as well. Itadaki mas! (Bon appetit!). 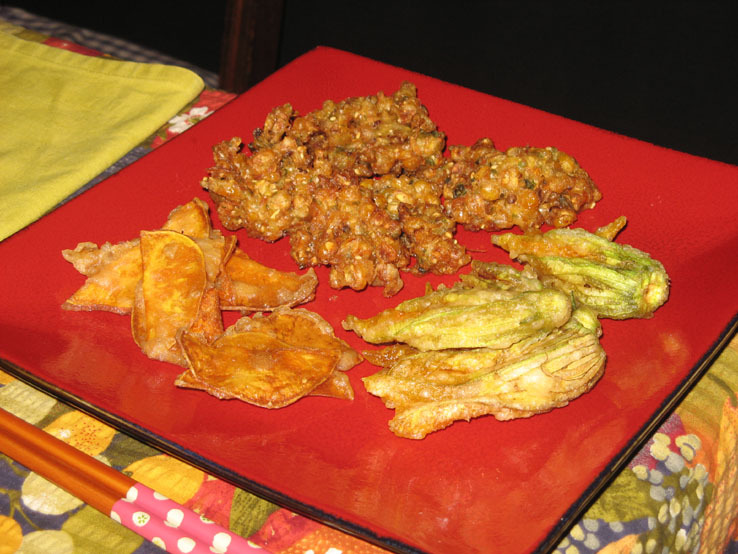 Tempura of corn, zucchini flowers and sweet potato. 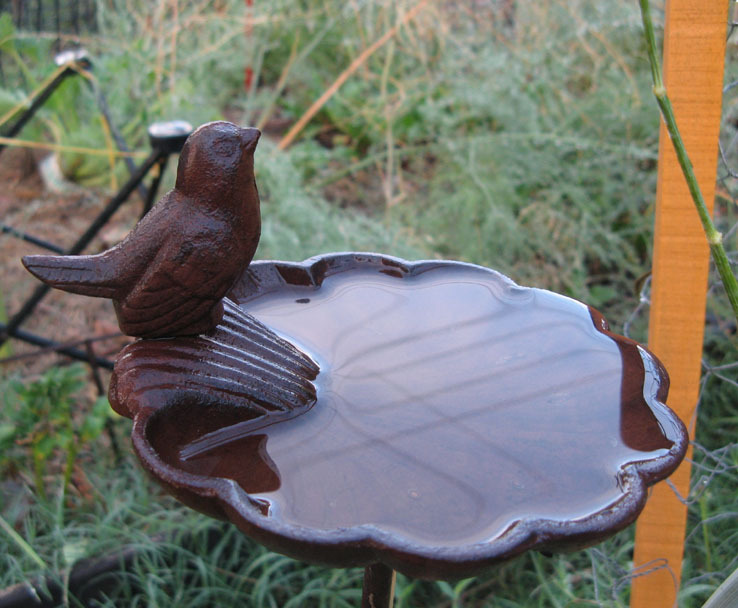 We are always interested in the birds that visit our garden. We grow a variety of plants without pesticides to encourage the greatest possible number of species to drop by. Of course sometimes they want to share our food as well. Once again my strawberries are being eaten by one of the local Pied Currawongs and recently the Crimson Rosellas have been helping themselves to our sunflowers. 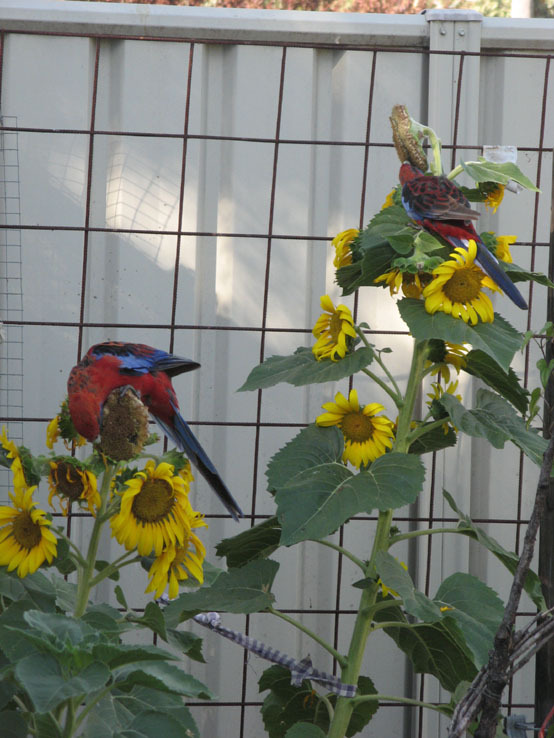 Crimson Rosellas helping themselves to our sunflower seeds. To be fair I hadn’t realised that there were seeds in the flowers until the birds started eating them. I thought the flowers had died off because of the very high temperatures at the time. The dead florets were hiding the seeds that sit below them. 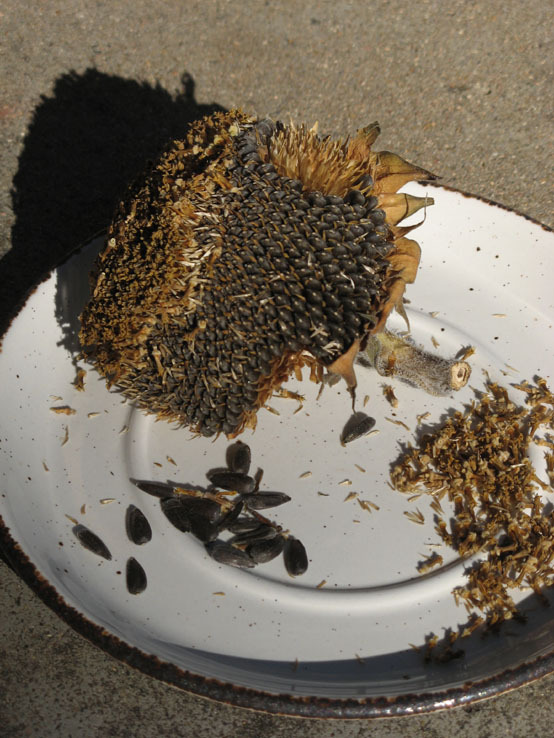 We are actually growing the sunflowers for our chickens to eat – they just love the seeds – so it was a fine irony to see their seeds being eaten by wild birds just outside the chicken run. However I did manage to save some seeds so the chickens will not miss out entirely. I hope we may get some more flowers after all the rain that we’ve just had. Speaking of chickens, our White Leghorn has decided to go out in sympathy with all those people overseas who are experiencing massive snow storms. She is currently moulting and I can barely keep up with removing her feathers from the run. Wherever she goes in the garden she leaves a white trail behind her. At least she’ll be pristine white again soon. Letty loses it all over the chicken run, while Artemesia looks on. Last but not least, except in size, the diminutive Superb Blue Wrens have been making a visit to our yard. These tiny birds, 14 cm from beak to tail, (approx. 5″ for those who aren’t metrically inclined), were just voted Australia’s favourite bird. As you can see from the pictures below they are very cute. 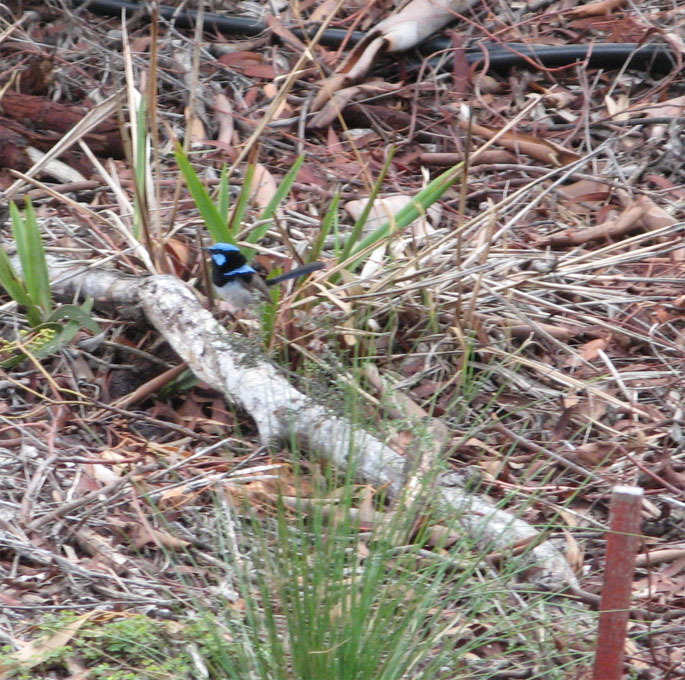 The male Superb Blue Wren has striking electric blue markings. This male arrived with his ‘group’ of 4 females, who are not very noticeable at all. Their dull colouring, as you can see, allows them to hide more safely from predators while they are nesting. 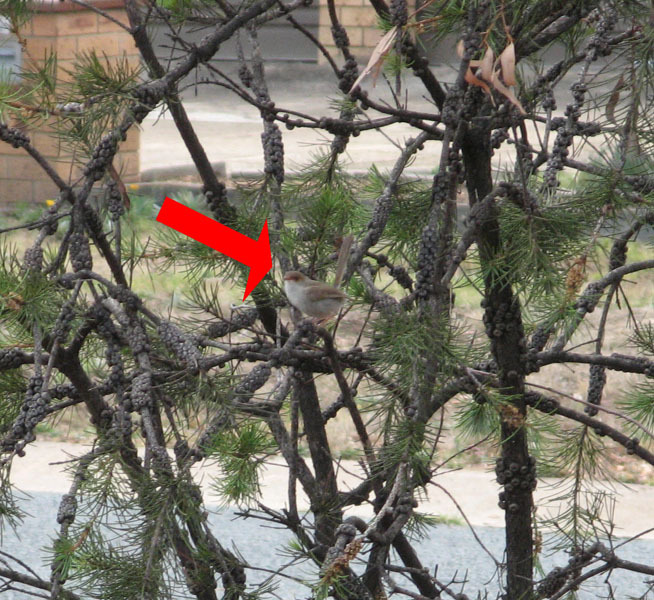 The female Superb Fairy Wren,( just near the tip of big red arrow). Owen’s words were a timely reminder to put aside worries and enjoy the results of our garden labours. 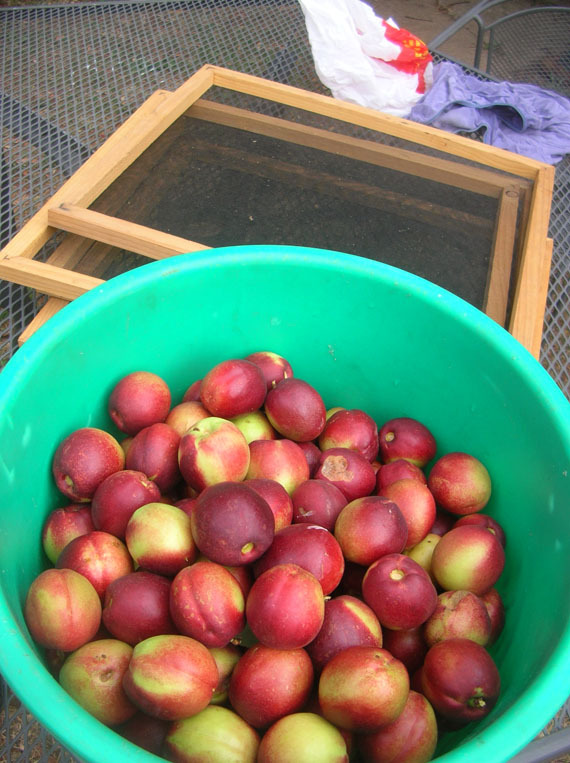 The day his comments were published I was harvesting my nectarines, well half a trees worth. I used most of them for dried fruit and stewed up the small amount remaining for more immediate consumption. Nectarines picked and ready to be cut into quarters for drying. While we were sitting cutting up the nectarines friend M dropped by. She’d just been to her mother-in-laws garden to harvest tomatoes. M has taken over several garden beds at the MILs to grow larger crops than her own small space will allow.What she had grown was an Australian heirloom tomato called a Palmwood. These are a climbing tomato, which M tells us have grown taller than the largest commercial garden stakes she could buy. The fruit is long and tapered, growing to about 12-15 cms in length. They certainly looked different to any tomatoes we’d seen previously. 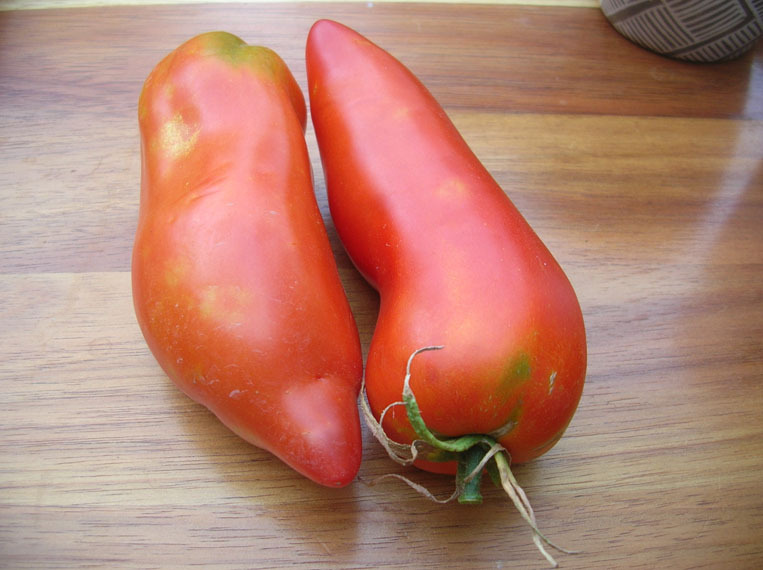 These are a paste-style tomato and are good for slicing as well as cooking. If you are interested the seeds can be purchased through Eden Seeds. Palmwood tomatoes, an Australian heirloom variety. 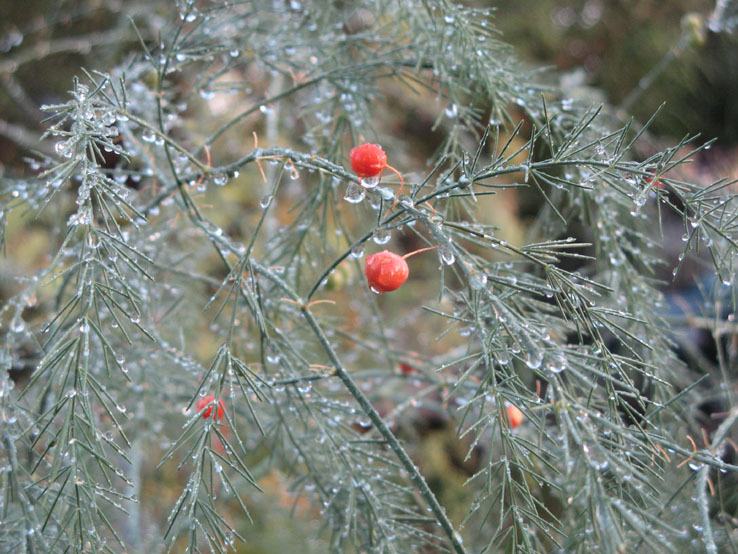 Today I enjoyed walking in the rain-soaked garden. After several months of virtually no rain the 50 millimetres we’ve received over the past two days is more than welcome. Seeds developing on our asparagus plants. Subsoil moisture will be restored improving growing conditions for all our plants. 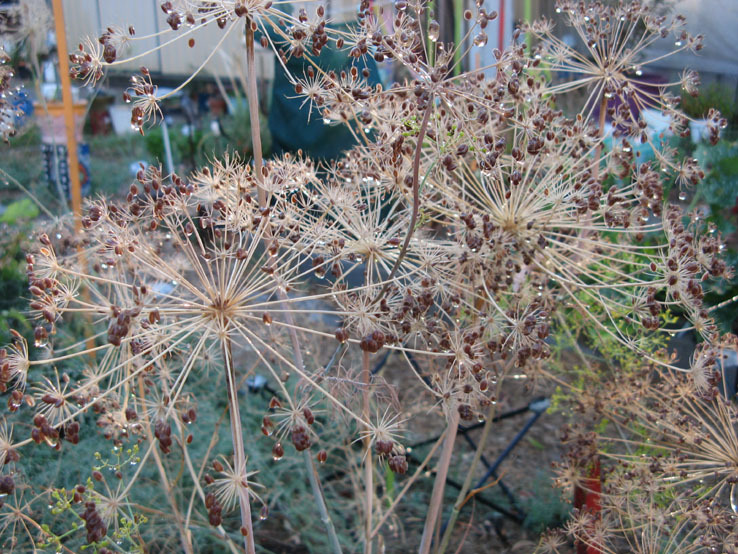 Seed heads on our dill plants. 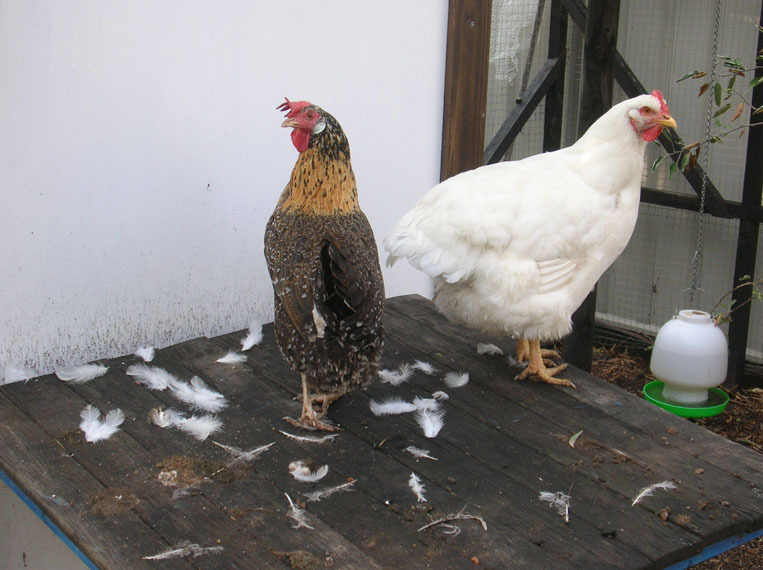 This is a story about Brown Chook, who was the sole survivor of a fox attack that killed all her flock mates. 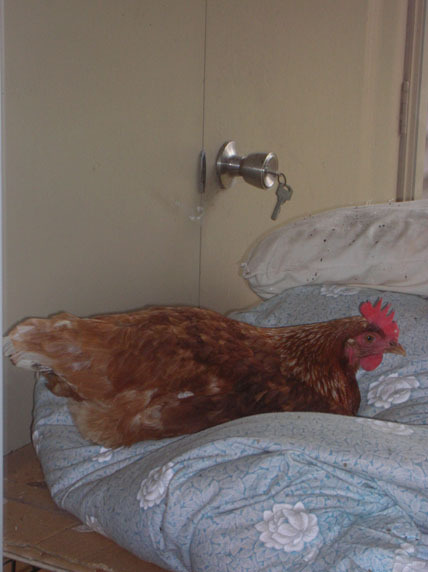 When I first met Brown Chook, some two months ago, she spent most of her time hunkered down in the back of her cage, too scared to move very far from safety in the daytime. But now changes have been made! 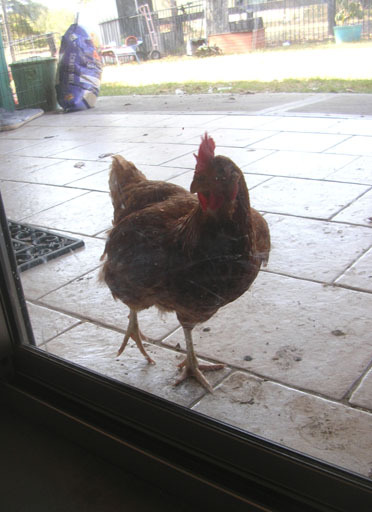 Brown Chook has decided that it’s safer to hang with the big guys in the ‘hood. Brown Chook hanging tight with the family. Brown Chook has moved as close to the family and the family dogs, as she possibly can. 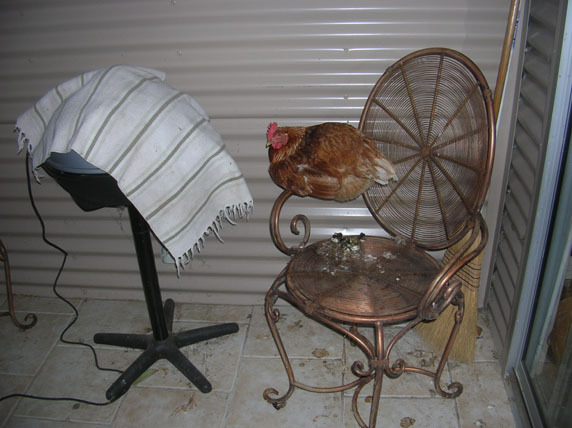 Her preferred roosting place is a garden chair outside the back door. 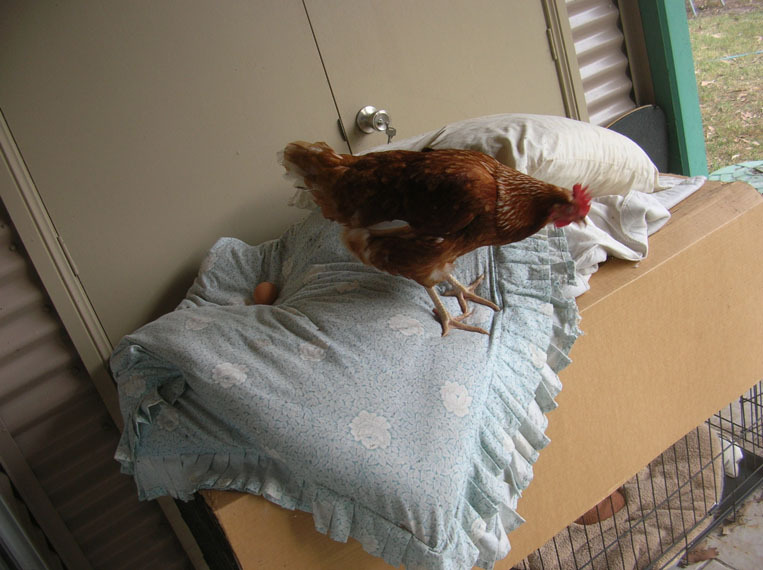 Not only does Brown Chook often jump into the dog run, which is rather odd given that one of the dogs has also attacked her, but she now prefers to nest on an old doona on top of one of the dog pens located at the back door! The comfort of a good doona, can’t be overestimated. Of course that does make it very easy to collect her daily egg and lowers the risk of breakage. Easy to collect egg system. And to think that we think chickens are dumb!